Sep. 19, 2018: On Friday, September 28, from 6:00 to 10:00 pm, the Eastchester Historical Society will hold its annual fall event, "Dinner with Edgar Allan Poe." The event will be held rain or shine under our tent on the lawn of the Marble Schoolhouse on the corner of New Rochelle Road and California Road. Cocktail hour with appetizers begins at 6:00 pm. 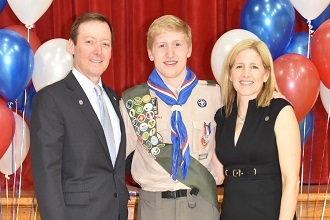 Silas and Vicki Ford of Bronxville will be presented with the Spirit of the Covenant Award in recognition of their extensive civic work. There will be a scrumptious four-course dinner catered by Scarborough Fair and beer, wine, and soda, all for only $100 per person. Charles Wissinger will portray Edgar Allan Poe and engage in a Q&A period afterward. There will also be a 50/50 raffle. Tickets are $20 each or five for $100; anyone can enter. There will be two winners of $2,500 each. Tickets can be purchased online at www.eastchesterhistoricalsociety.org under the events tab. 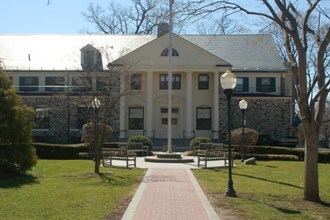 Pictured here: Eastchester Town Hall.